That misconception is that they’re perpetually expensive. Sure, quality demands a premium. It would make sense that upper-crust businesses usually go for upper-crust valuations. However, it’s not true that they’re always expensive. In fact, I saved and invested my way into an early retirement by buying shares of high-quality businesses when they were undervalued. I went from below broke at 27 years old to financially free at 33. And I’m now retired in my 30s. 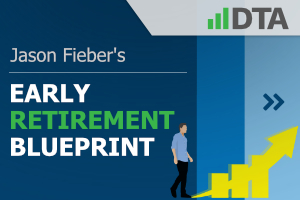 I recount how that happened in my Early Retirement Blueprint. Suffice to say, there was a lot of buying high-quality stocks at appealing valuations. The end result of that is my FIRE Fund. That’s my real-life and real-money early retirement stock portfolio. It generates the five-figure dividend income I need to sustain myself without a job. There are positions in over 100 of the world’s best businesses. I know they’re great businesses because they’re almost all high-quality dividend growth stocks. Most of the stocks in my portfolio can also be found on the Dividend Champions, Contenders, and Challengers list. The CCC list has compiled invaluable information on more than 800 US-listed stocks that have all raised their dividends each year for at least the last five consecutive years. Rising dividends for years – or decades – on end generally requires the growing profit necessary to sustain those increasing cash dividend payments. You can’t pay what you don’t have. Thus, a lengthy dividend growth track record is a very good initial litmus test of business quality. 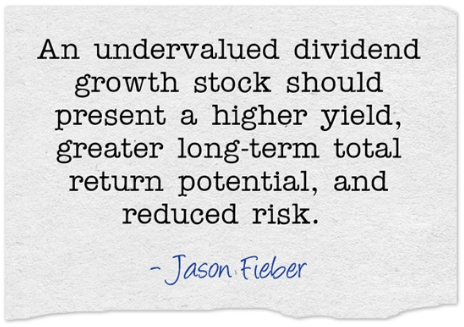 That’s just one reason (of many) I’m a dividend growth investor. Of course, those growing dividends also serve as a fantastic source of reliable and increasing passive income. That allowed me to quit my job and retire extremely early. Now, quality is great. But valuation is always extremely important. 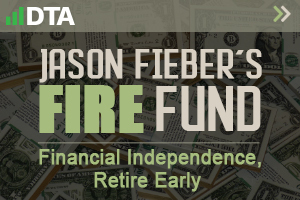 I didn’t retire in my early 30s by routinely overpaying for stocks, nor should you ever overpay for your investments. That’s all relative to what the same stock would otherwise offer if it were fairly valued or overvalued. Since total return is comprised of investment income and capital gain, greater long-term total return potential is locked in right off the bat because of the increased investment income (due to the higher yield). Plus, capital gain is given a possible boost via the “upside” that’s available between price and value. Buying a stock when the price is below intrinsic value provides a nice opportunity for capital gain if/when that gap closes. And that’s on top of whatever capital gain would naturally manifest itself as a quality company becomes worth more over time. An investor introduces a margin of safety, or a buffer, when price is below fair value. This protects the investor’s downside against known and unknown risks alike. We can never predict the future, and our investment thesis could be wrong, which is why it’s important to be conservative and always seek to invest when there’s a margin of safety between price and perceived intrinsic value. Fellow contributor Dave Van Knapp delved a bit more into why valuation is so important and how to go about valuing dividend growth stocks through Lesson 11: Valuation, which is part of an overarching series of “lessons” on DGI. It adds a ton value on top of this quick primer, so make sure to check that out for more on valuation. Air Products and Chemicals, Inc. (APD) is a major global producer and supplier of industrial gases. They’re the largest supplier of hydrogen and helium in the world. Founded in 1940, Air Products & Chemicals now operates as one of the largest industrial gas companies in the world. Industrial gases are absolutely critical to a number of industrial processes. Stated simply, a large number of products cannot be manufactured without industrial gases as input. This, of course, essentially guarantees demand from the gases that Air Products & Chemicals supplies. And because of the wide range of processes and end markets that require these gases, Air Products & Chemicals is incredibly diversified by the very nature of the business model. These gases are a part of everything from food processing to energy product refining. There are only three major industrial gases suppliers in the world, which has set up a global oligopoly. Furthermore, there are high switching costs in this industry, which greatly benefits Air Products & Chemicals and its shareholders. The company will often build out the on-site infrastructure for clients’ gas supply, and this comes with lengthy (10-20 years) take-or-pay contracts. All of this bodes well for the company’s continued ability to increase its profit and dividend payments. As it sits, Air Products & Chemicals has impressively increased its dividend for 37 consecutive years. The 10-year divided growth rate stands at a stout 9.6%. And with a very manageable payout ratio of 60.7%, the dividend is clearly sustainable and in a position to grow roughly in line with earnings per share. This all comes on top of a yield of 2.79%, which is almost 40 basis points higher than the stock’s own five-year average yield. A yield near 3% and a long-term DGR of almost 10%. These are heady numbers. However, I would expect near-term dividend growth to be a bit more muted than the long-term average because the payout ratio has climbed a bit in recent years. The most recent dividend increase, for context, was under 6%. But I think, as I’ll show, the long-term expectation for DGR should be in the upper single digits. That sets up shareholders for very solid long-term total return – perhaps in the low double digits, annually. Let’s build that expectation by first looking at what kind of top-line and bottom-line growth the company has produced over the long term, then compare that to a near-term go-forward professional forecast for profit growth. Blending the known past and expected future in this manner should give us plenty to work with. The company grew its revenue from $8.256 billion in FY 2009 to $8.930 billion in FY 2018. That’s a compound annual growth rate of 0.88%. A standstill over the last decade isn’t what any investor wants to see. However, the lack of revenue growth is easily explained by the fact that Air Products & Chemicals has shed some non-core businesses over this period in order to reshape and improve their business portfolio. They spun off Versum Materials Inc. (VSM), an electronics materials company, in 2016. And they sold their performance materials business in early 2017. Looking at profit on a per-share basis is a much more accurate indication of a company’s growth and earnings power, especially in this case. Earnings per share increased from $2.96 to $6.59 over this period, which is a CAGR of 9.30%. Notably, they did this without a meaningful reduction in the outstanding share count. Instead, it’s basically a margin expansion story here. The aforementioned portfolio reshaping has clearly driven much of that expansion, creating a better and more efficient company as a result. They’re more focused on their gas offerings, reducing exposure to commodified materials businesses. Looking forward, CFRA is predicting that Air Products & Chemicals will compound its EPS at an annual rate of 13% over the next three years. Volume growth (particularly in Asia), margin expansion, cost reductions, and a strong backlog of projects are all cited as rationale behind this forecast. The most recent guidance from Air Products & Chemicals has been for adjusted EPS to come in a 10% YOY increase, at the midpoint. So we’re not far away from what CFRA is looking at. That said, I don’t believe Air Products & Chemicals has to produce 13% annual growth in order to be an outstanding long-term dividend growth stock investment. Even just coming in at somewhere closer to their long-term result of 9% would allow them to easily grow their dividend at 7% to 8% per year. These numbers are all right in line with what they’ve historically produced. Even a continued status quo is enough for 8% annual dividend growth, which comes on top of a yield near 3%, setting investors up for long-term total return in the low double digits. Moving over to the balance sheet, Air Products & Chemicals runs a tight ship. The balance sheet is rock-solid across the board. The long-term debt/equity ratio is 0.31. Cash and cash equivalents add up to over 80% of long-term debt. Moreover, the interest coverage ratio is over 16. Profitability is also quite robust for the firm. As noted earlier, margins have expanded quite a bit in recent years. Air Products & Chemicals is posting up fantastic results. Over the last five years, the company has averaged annual net margin of 16.49% and annual return on equity of 17.87%. This is a high-quality company across the board. It’s actually even more of a quality enterprise today than it was a decade ago. Margins are up. Free cash flow is tremendous. And the balance sheet is very solid. Of course, there are risks to consider. Although the company operates within a global oligopoly, the existing competition is fierce. Regulation and litigation are omnipresent risks for every business. Perhaps most importantly, any large economic slowdown could greatly hinder industrial output. That would thus reduce demand for industrial gases. But almost four straight decades of dividend raises speaks for itself. That period, by the way, includes the recent financial crisis and ensuing Great Recession. This is a durable business. It’s built to withstand economic ups and downs. A company like this usually goes for a premium. The stock is trading hands for a P/E ratio of 21.76, which is a sizable discount to its five-year average P/E ratio of 26.0. The P/CF ratio, at 14.0, is also well below its three-year average mark of 15.3. And the yield, as noted earlier, is notably higher than its own recent historical average. Furthermore, it’s a yield that’s substantially higher than the broader market. The stock does look cheaper than it ordinarily is. But how cheap might it be? What would a reasonable estimate of intrinsic value look like? That DGR is realistic, in my view. It’s arguably conservative based on what’s already transpired over the long run. The payout ratio is moderate. Long-term EPS growth more than supports this thesis. And the forecast for go-forward EPS growth is even higher than what the company’s produced over the last decade. However, I do like to err on the side of caution. Any major economic disruption or recession would obviously impact the dividend growth rate. I would fully anticipate the dividend to continue to flow and grow in that scenario; it’s just that the growth rate would temporarily drop. The DDM analysis gives me a fair value of $199.52. So it doesn’t appear to be a raging steal. I’m not saying this stock is massively underpriced. However, it does appear to be undervalued by my calculations. That’s an opportunity when you consider the high level of quality. As I noted earlier, high-quality stocks are not always priced at a premium. This would be a good example of that. Morningstar rates APD as a 4-star stock, with a fair value estimate of $187.00. CFRA rates APD as a 3-star “HOLD”, with a 12-month target price of $169.00. We’re all in agreement that the stock is not priced at a premium right now. It’s simply a variance in terms of how much of a deal the stock is. Averaging out these three numbers gives us a final valuation of $185.17, which would indicate the stock is possibly 11% undervalued right now. Bottom line: Air Products and Chemicals, Inc. (APD) is a high-quality company that operates as a major player in a global oligopoly. Their products are necessary across most manufacturing processes in the world. Almost four consecutive decades of dividend increases, a market-beating yield, a reasonable payout ratio, strong underlying growth, and the potential for shares being 11% undervalued could be just the opportunity you need to pick up this high-quality dividend growth stock at an appealing valuation. Note from DTA: How safe is APD’s dividend? We ran the stock through Simply Safe Dividends, and as we go to press, its Dividend Safety Score is 94. Dividend Safety Scores range from 0 to 100. A score of 50 is average, 75 or higher is excellent, and 25 or lower is weak. With this in mind, APD’s dividend appears very safe with an extremely unlikely risk of being cut. Learn more about Dividend Safety Scores here.